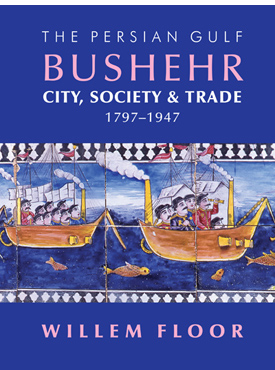 This book discusses the political and economic history of the port of Bushehr, which by the end of the eighteenth century had become the gateway to southern Persia (Iran). It offers a detailed analysis of Bushehr’s demography, industry, health care, education, and standard of living; as well as its trade, and how politics impacted its well-being. Throughout this period Bushehr had to ward off the growing competition from other Persian Gulf ports such as Bandar Abbas. It did so successfully, enjoying growing trade and wealth, despite internal and external political problems. Because of its important commercial position Bushehr was also twice attacked and occupied by the British (1856, 1915-18). What brought the port city down finally, however, was not the British attacks and occupations, nor the occupation and looting of the city by Tangestani tribesmen (purported protectors of the constitution) in 1909; it was the expansion of the ports, roads, and railroads of the oil-rich province of Khuzestan. This caused economic decline for Bushehr, which resulted in a loss of trade and much of its population between 1920 and 1940. The World War II years did not bring much improvement to its situation either. The economic malaise contributed to a tribal uprising in Fars in 1946, in which Bushehr played an important role. However, the uprising failed, and as such was but a last spasm of a bygone era. Willem Floor studied development economics and non-western sociology, as well as Persian, Arabic and Islamology from 1963-67 at the University of Utrecht (the Netherlands). He received his doctoral degree from the University of Leiden in 1971. Since 1983, Dr. Floor was employed by the World Bank as an energy specialist, however, after his retirement in 2002, he has dedicated his time to the study of the social and political history of Iran, and has published extensively throughout this time. His books include: Public Health in Qajar Iran, Agriculture in Qajar Iran, and The History of Theater in Iran, as well as, The Persian Gulf: A Political and Economic History of 5 Port Cities, 1500-1730, its second volume, Persian Gulf: The Rise of the Gulf Arabs, 1747-1792, third volume, The Rise and Fall of Bandar-e Lengeh, the fourth volume, Bandar Abbas: The Natural Gateway of Southeast Iran, and the fifth volume, The Persian Gulf: Links with the Hinterland Bushehr, Borazjan, Kazerun, Banu Ka’b, & Bandar Abbas. He has also published, Travels Through Northern Persia, 1770-1774, Titles and Emoluments in Safavid Iran, and A Social History of Sexual Relations in Iran; Labor and Industry in Iran, 1850-1941; Guilds, Merchants and Ulama in 19th Century Iran; The Rise and Fall of Nader Shah; Games Persians Play, and History of Bread in Iran. His translations include: Samuel Gottlieb Gmelin’s Travels Through Northern Persia 1770–1774 , and with Hasan Javadi, Abbas Qoli Aqa Bakikhanov’s The Heavenly Rose-Garden: A History of Shirvan & Daghestan; Evliya Chelebi’s Travels in Iran and the Caucasus, 1647 and 1654; A Man of Two Worlds: Pedros Bedik in Iran, 1670–1675, The Persian Gulf: The Hula Arabs of The Shibkuh Coast of Iran, and The Persian Gulf: Dutch-Omani Relations A Commercial & Political History 1651-1806, and The Persian Gulf: Muscat – City, Society and Trade .